Today, I am going to continue my musing about that elusive “red thread” I wrote about yesterday. In case you missed it, this relates to the writing of my Turkish-American marital memoir. And in case you don’t know what in the heck a red thread is, a dear friend of mine who is a great writer and editor refers to the “necessary red thread” in any writing one does. As I said yesterday, and I quite like the metaphor, it is the theme that pulls it together, the point that acts like a magnet for all of the words included in any given bit of writing. And it is this red thread that is elusive at the moment while revising of the first draft of my now 300 page work. 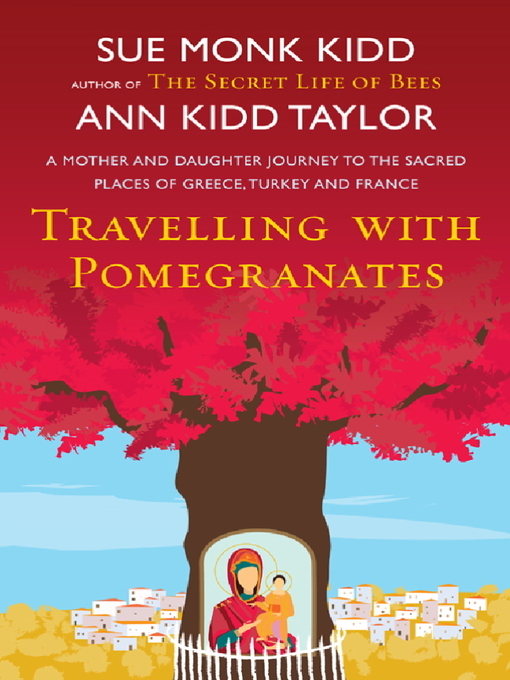 So, a couple of years ago, I read Travelling with Pomegranates: A Mother-Daughter Journey to the Sacred Places of Greece, Turkey and France, which is a double memoir written by Sue Monk Kidd and her daughter Ann Kidd Taylor. Structured into three sections inspired by the Demeter/Persephone myth: LOSS, SEARCH and RETURN, the memoir’s red thread emanates vibrantly – it is about growing up and growing old – and the relationships between mothers and daughters. Clear as a bell, it had structure, and a glowing red thread, it was glowing so much, it was really almost neon, if you ask me. Upon reading the book for a second time this summer, I sat up in my chair and thought “I need a structure like that – forget the whole driving thing – that’s too confusing – and surely a simple structure will create an infrastructure for my red thread.” And then my mind went blank, totally blank, for months that felt like sandpaper. And then, this fall, while re-reading an academic paper I had written that related to immigration, it hit me – there it was – a conceptual model for migration often used in social work practice with immigrants in the United States – and in many ways – our marriage is in constant migration. Reflecting further, I thought, we do travel between worlds both while in Turkey and while in the United States. M. always says he feels more American in Turkey now. I am often thinking about Turkey while engaging in normative American behaviors – or Turkish-American behaviors. We often talk about Turkey. We eat Turkish food every day. We drink Turkish tea all the time – and on and on. And given that idea, that we travel between worlds on a constant basis at both the micro and a macro levels, what does a conceptual framework for migration do for structuring this memoir – or for finding my red thread? So the conceptual model of migration I found goes like this: When working with immigrants to a new country, there are three phases they may be in. And, as a social worker, one should assess for which phase that person is in so that you can put yourself in their shoes some. Those three phases are: Pre-migration; Transition and Re-settlement. Now, as a student of the impact of globalization and transnational migration patterns, I know full well that this conceptual model is flawed – as many people only migrate on a temporary basis, with the intention of returning “home” someday. With globalization we are exposed to cultures and subcultures constantly, able to rotate between places and homes and cultures very easily, if the penny permits, we are not isolated – and we are dealing with it all, all at once. So, this started to make sense vis-a-vis how I experience my cross-cultural marriage. There was something there I felt I could work with. So, I began to think about migration. Now, I have not migrated anywhere permanently, except perhaps in my own mind. And I am hardly an expatriate at this point, although that is the group of folks I feel most akin to. And that is why the workshops conducted by those super-smart and interesting ladies over at Global Niche are calling me like a siren song – as they can relate to the confusion of place, culture and identity in the cross-hairs of in-between. M. is with me in those cross-hairs, and I think that somehow our time both in the United States and in our extended stays in Turkey has caused me to migrate my mind and perhaps my thinking and some day-to-day practices of life. As for M., he migrated from Turkey to the United States in part as a way out of tradition and customs that did not feel right to him, akin to rubbing a dog’s hair the wrong way, constantly. And perhaps that is why life in another culture comes easily to him, I don’t know. Section 1: Pre-migration: This section of the book will be a series of chapters about my early exposure to Islam, Muslims and countries in the Middle East. It would also address my youthful obsession with being different – and exploring different cultures. It will end with a chapter on meeting M. and the beginnings of my foray into a cross-cultural relationship. Section II: Transition: This section of the book will address what started to happen as M. and I began to get serious and move towards marriage. In these chapters, I will address the challenges we faced as families in both countries were met – and as cross-cultural booby traps began to explode. Section III: Resettlement: This section of the book is where the true learning and comfort-creation began to emerge. I began see beyond the mystery and glam of being married to a foreigner and we began to make our own way with which traditions we did and did not want to keep in our married life. And now, as I come back to read this before posting it today, I remember my friend Deonna’s wise and thoughtful words to me in response to yesterday’s post. Deonna is also writing a memoir – and she said “I will tell you something simple, but even I can’t follow it: don’t over think it.” I’m in your club, Deonna, and now I am even more confused! However, I am very certain that the way will become clear! This entry was posted in On writing about my life with the Karagöz puppets, Turkish-American Matters and tagged cross-cultural, cross-cultural marriage, Globalization, memoir, migration, Sue Monk Kidd, Transnational, Turkey, Turkish American, Writer Resources, writing. Bookmark the permalink. I love the red thread; i love the migration structure; i love reading your writings about writing, and culture and being between worlds, which is where we always are, whether we know it or not. I used to call it the ‘golden thread’ back in the days when I had a proper job. I really like this new idea of migration structuring your novel (and I would love to read your book when it comes out!!) I read Travelling with Pomegranates this past summer and it is indeed soaked in symbolism that aids a very clear cut structure – it was a great read. With memoir it seems like there is a challenging distinction between letting the structure emerge naturally from the story and constructing the story around a structure – your idea of migration seems very natural in my opinion. Tebrikler on writing a book!! Hi Turklish! thank you so much for this comment. I agree I really like the migration metaphor. I am sure you can relate to it. It’s interesting, most people have been more positive about the car analogy. However, the people in a Turkish-American relationship, have appreciated this one. Food for thought! This is very true. And I think this is some of what you really taught us this summer, which has lasted an hour lives. We need to smell the roses more. It’s interesting, Jack, a lot of people have told me about the different colors they have assigned to various different threads such as the red thread that I wrote about. You’re certainly a master at finding bedspreads (dictation for red threads), and I can’t wait to hear about the new work or actually the two new works. Thank you. I hope they don’t disappoint.